It's been a month since my last post. I almost became one of the statistics wherein more than 90% of new bloggers tends to abandon blogging after a month without new post. As I have mentioned on my initial post (read here), I have a habit of enjoying a hobby for a short period of time. I might have enough excuse not to post anything last September. 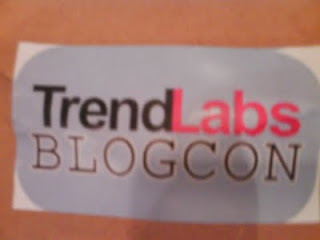 I attended a company sponsored conference "TrendLabs BlogCon" with a theme "may kwenta kwento ko". I figured that before I post a new one, might as well learn something from some of the known blogger in the web. Maybe it was just my excuse for not posting anything :-). 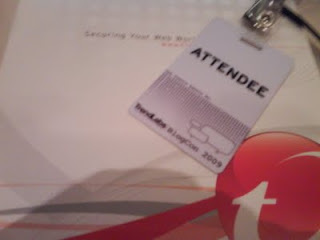 To tell you the truth, I attended it because we heard that the marketing team who spearheaded the activity will give away some goodies. One of my team mate whom I invited to attend later session was able to get the cool Skull Candy headset. So what have I learned from Jayvee Fernandez (A Bugged Life), Abe Olandres (Yugatech), Hay Men! writers, and from our own Ryan Flores (Malware Blog). Here are some thoughts that I have learned from them when I am not fighting sleepiness (I apologize! We just came from our night shift). Write what you like. All of the speakers mentioned it. How will you be able to write something you do not want to discuss? Make your blog your diary. If you cannot think of something to write about. Check if something wonderful or exceptional happened to you recently. Blogging is a way to express yourself. You are the master here. You do not have an editor that will tell you what you should write or not. This is your channel to share your thoughts. It should be a hobby or past time, not work. As mentioned earlier, 90% of the new bloggers tend to stop after a month for some reason. For my part, I am thinking blogging to be a new past time instead of playing online games. To be fair, I'll cut my playing time half and do something for the blog. Read, read, read. To be able to write something you need to read other materials, other blogs, newspaper, magazines and others. This way you can expound your vocabulary and be able to be a better writer. K.I.S.S. People like to read shorter topics nowadays. That is why twitter works well today. There are other tips shared by the people but following rule number 6, it would lengthen this post and its just my excuse of cutting this topic off. There is always next time to add the other lessons learned.